You are viewing the John Hendrix tag archive. In 1930s Germany, pastor and theologian Dietrich Bonheoffer watches as his country is taken over by a madman. Adolf Hitler is incrementally growing power, committing atrocities against humanity, and despite all odds, not being stopped. When Hitler claims to be ordained as Germany’s leader by God himself, bringing the German Church to be one with the Nazi party, Dietrich knows he can no longer stand for Hitler’s falsehoods. 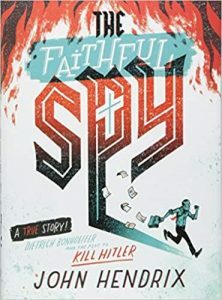 To save his country and humanity from Hitler’s megalomania, Dietrich knows that to be true to God, he must turn his back on two of the tenets he has held most dear in his life of faith—the sanctity of country and the sanctity of all human life—and join fellow German conspirators in a plot to kill Hitler.